Shelby Fredericks is swarmed by two defenders. 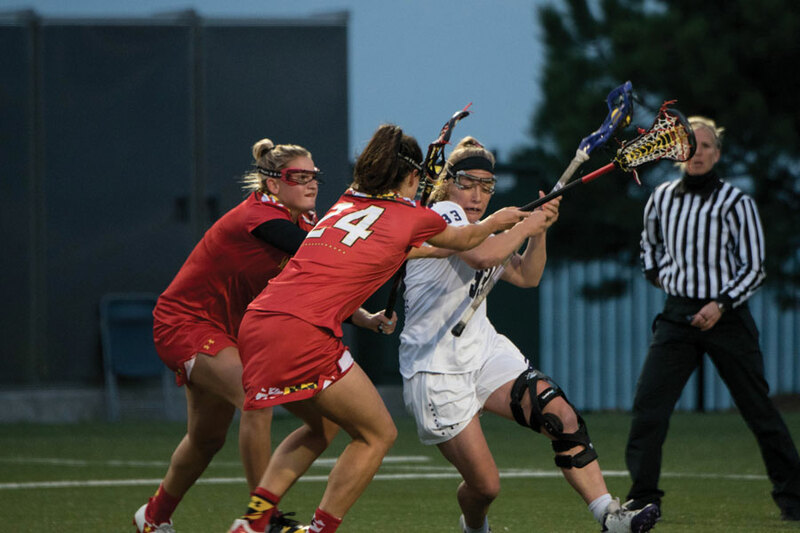 When senior attacker Shelby Fredericks buried a free position shot with about 10 minutes left in the game, it appeared she had cut Northwestern’s deficit to one as part of a four goal run. But upon inspection, the goal was called off to due an illegal stick and Stony Brook quickly extended its lead to three. That ruling, and other missed opportunities, led to the No. 10 Wildcats’ (4-2) 15-10 loss against the No. 1 Seawolves (4-0). Aggressive defense by Stony Brook led to ample opportunities for NU in the form of free position shots and extra-woman opportunities. The Cats had 11 free position shots compared to five for the Seawolves, but they converted just two of the 11, partially due to the superb efforts of Stony Brook goalie Anna Tesoriero, who had 11 saves on the day. On NU’s first extra-woman opportunity in the first half, Stony Brook was able to score short-handed to open up an early 3-1 lead. On the second and final extra-woman opportunity later in the first half, a mishandled catch by senior defenseman Ally Mueller allowed the Seawolves to burn the penalty and escape unscathed. One of the reasons the Cats were able to hang in the game was their dominance on draw controls. Thanks largely to Fredericks, NU won a dominant 18 of the first 24 draws in the game before losing the last three when the game was largely out of reach. “It was just trusting my preparation, and I think that my circle girls did a great job communicating to each other. And they did an amazing job boxing out which made my job a lot easier,” Fredericks said. The Cats started the game slowly and went into halftime with a 6-3 deficit. But in the second half, Fredericks said the team played with more passion and energy that allowed them to keep the game close against the nation’s top-ranked team. After the half, NU scored two goals 42 seconds apart to bring the game within one. However, the Seawolves slowly built their lead back up to a commanding 10-5. That was when the Cats responded with back-to-back-back goals within 2 and a half minutes. Then Fredericks’ stick violation broke the run. NU ultimately got within two with six minutes remaining before Stony Brook scored several late goals as the Cats’ defenders hunted turnovers to make the game appear more uneven. Senior attacker Sheila Nesselbush starred on offense for NU, recording a career-high five points, including a hat trick in the first half. Nesselbush said she was encouraged by the team’s performance, but also regretted mistakes the team made that cost it a chance at an upset.